Aled Jones meets people who have chosen to help others, and introduces some inspiring hymns. Browse content similar to Change the World. Check below for episodes and series from the same categories and more! in the National Portrait Gallery? Well, they're all people who have, in some way, changed the world. And why you don't have to be as rich as Bill Gates to make a difference. Plus, some classic hymns from around the country. because he discovered the smallpox vaccine. than the work of any other man. but he's best known for his part in the abolition of the slave trade. You know, it's often faith that inspires people to try to make a difference. Mother Teresa and Martin Luther King for example. and name a man whose life changed our history for ever. that's done the most for this world, who would it be? Jesus Christ, I'm sorry, but Jesus Christ. It has to be, it has to be Jesus Christ. We're all Christians. Martin Luther King, that's a great answer as well. Inspire everyone to Jesus Christ. One thing about the world, it would be tolerance for everybody. but the news is still full of stories of man's inhumanity to man. to try to make the world a better place. On 9/11, I lost my cousin, David Fontana. that died while they were helping to rescue people from the World Trade Center. without breaking down, so I just sort of buried it a bit. and I thought, "How could young British men do something like this?" and I felt that my cousin Dave was waiting for me to make a response. Not the first response which is of anger and grief and rage and despair. and I thought, he's waiting for me to do something. So, we started Project Mosaic. between people of different backgrounds. and we can't just assume it's going to work itself out. We often talk about, "What can the government do? "What can the teachers do? What should the police do?" I think it's all about on the grassroots level. It's what can people in their everyday lives do. she had to appeal to young people. so it is important to find the right language that works for young people. That can sometimes be a challenge for older people like me! is by running a short film competition. Last year's winner was 23-year-old Tariq Chowdhury. Tariq's film aims to dispel the idea that faith is divisive. and I thought that would be a great thing to espouse. to highlight their central, unifying message. faith groups is their love, their sincerity, their compassion. but really, the significance is what's in their heart. I really don't agree that religion is the source of problems. make things worse, they were always make things better. That's true of every faith, I really believe that. # Don't you think it's time? Don't you think it's time? Is it possible to change a community by planting vegetables? is trying to do just that by cultivating every spare inch of land in the town. We've got vegetables growing in very public places. We've got them in lots of public spaces. at the railway station, at the bus station. in the supermarket start to see where it grows in its natural state. we've got children now doing qualifications in agriculture. there are job opportunities around local food. and that means that they start to think about how they spend their money. So that means they start to support the local market. the town starts to work again as a community, as market towns always used to be. all the produce from the town and we cook it up and have a fantastic time. It doesn't cost anybody anything. and I see a cabbage growing, I just help myself? Yes, help yourself. Absolutely, help yourself. just the most fabulous and magical things happen. into a veg patch with a big "Please help yourself" sign on it. they left a bowl of soup that they'd made from the veg on Mary's doorstep. and we're starting to see that all over the place. the spirit of Incredible Edible. the rain is good for the vegetables. Very good for the vegetables! They're doing remarkably well. -I have to say, it's a normal day for Todmorden, really. -It's not often you see vegetables growing in the graveyard. It's been four years now and the community have accepted it. and said, "How about putting some vegetable beds in here?" We thought about it and went through the channels and said, "Yeah, we'd welcome it." And it's been a really good opportunity for the community. So who comes up here? A lot of the time you will see the children from the school. I don't know if you can see back there? The children will often come and tend the vegetables. people who walked dogs through the woods into the churchyard will come. Everybody in the community comes and takes a lot and enjoys. -It's a great idea, isn't it? but to give it over to God's creation in a lateral thinking sense. so why is it not happening in every single community around the world? Northern Ireland, and in Holland so it is starting to happen. we do have churches that have put fruit trees and bushes. "so let's bring our community together and grow collectively." You've obviously got a massive passion for it. Do feel that is a calling for you in a way? I've done lots of things in my life in the private and public sector. I've never done anything more important than this, ever. This is about trying to change the world around us for our children. "and pass on a better world." So there is nothing more important to do than this. Here in Suffolk, the church is using the internet to help those in need. Connect those who need help with those who want to make a difference. It's all inspired by a verse in the Bible. to go and sell their property to share even more. to each and every one in the church community as they had need. If someone is in need, a request is posted on the Acts 435 website. seeking help and decide who they'd like to give money to. They can choose whether to give the full amount or just part of it. so I don't see why it can't go viral and international. that they are the ones who know the people who are in need on the ground. the spokesperson for the person in need. about why this person can't actually fund what they need for themselves. We don't all have to be Bill Gates to help. particularly if we know it's going to make a big difference at the other end. and we needed a mattress. We came up and had a word with Pam and she got the ball rolling. so it's a lovely Christmas present. So that mattress literally changed your life? and I go to church every Sunday and I really enjoy it. and there are so many needs that come in. and they are setting up homes and they need to be established. could help top up their heating bills. We needed a new cooker basically. hopefully, the money would be there for me to buy a new cooker. How difficult was it for you to get in touch with Acts? we live in a desperate world and when people are desperate they turn to anywhere for help. How did you feel when that money was handed over? Just overwhelmed with people's generosity, basically. which is now finished and my faith has grown and grown to be honest. So how do you feel when you hand over the money? receiving this and to know that somebody cares enough. when they come in to actually receive their donations. Do you think you guys are changing the world? in changing people's attitudes, yeah. Changing people's worlds, one life at a time. "If I was the only person, Christ would have died for me." Each individual person. So we are changing the world. Bit by bit, life by life. Well, I applied online, put your request on. And people have now donated money. to grant over 500 requests including Anna and Pedro's. Can I say thank you to everyone. -I would just like to hand that over to you. because they are so grateful and so glad to receive. -Do you think this could make people lazy in a way? because, as Christians, we have to be good stewards of the money. in the first place, we interview them. God is love. And that is what we want to communicate. because people do ask us why we do it. on holiday until they were given a place to stay. Trouble is they didn't have the money to get there. Well, the good news is that it's actually been successful. -And we've actually got £100. Wow, that's fantastic, that's brilliant. If it isn't for the work you do, it wouldn't be possible. and it's fantastic, isn't it? -You really do change people's lives. # When I needed a neighbour Were you there, were you there? # When I needed a neighbour Were you there? # I was hungry and thirsty Were you there, were you there? # I was hungry and thirsty Were you there? # I was cold, I was naked Were you there, were you there? # I was cold, I was naked Were you there? # When I needed a shelter Were you there, were you there? # When I needed a shelter Were you there? # When I needed a healer Were you there, were you there? # When I needed a healer Were you there? To promote fairness and equality. And to alleviate suffering and poverty. but I have been told, it's in the attic. I hope you can join me for next week's Songs Of Praise when I'll be exploring silence. and some teenagers who turn off their music and mobiles for a spot of silent worship. And of course, we'll have hymns from around the country. 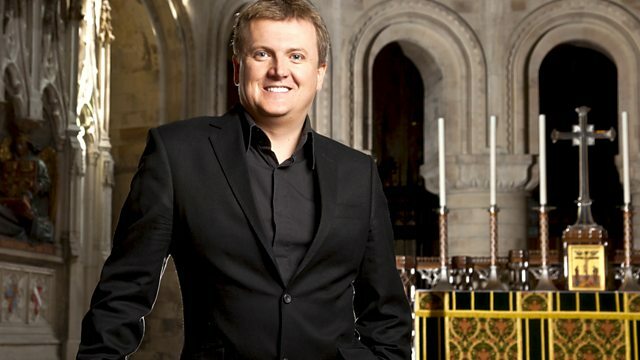 Aled Jones meets people who've chosen to make a big difference to help others and introduces some inspiring hymns.